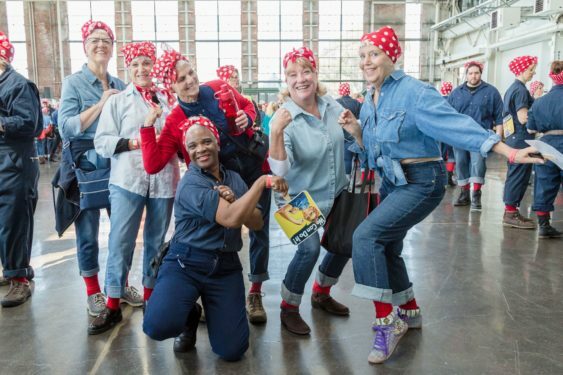 Thousands will gather at the Rosie the Riveter/WWII Home Front National Historical Park for the 4th Annual “Rosie Rally” and Home Front Festival. 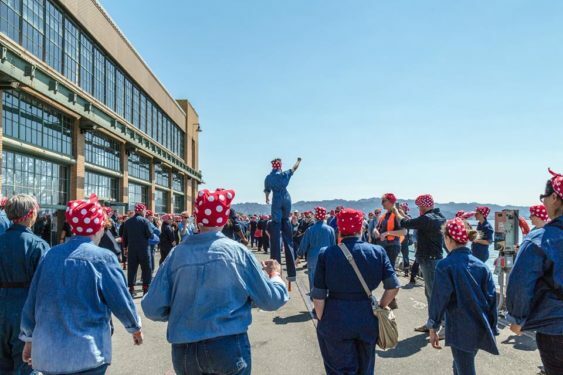 This year, instead of breaking the Guinness record, everyone is encouraged to update Rosie or represent home front occupations in creative ways, or to come in traditional garb to join the largest Rosie celebration and festival yet. This year’s event will honor original WWII Rosies and home front workers and celebrate the ordinary people from many backgrounds, races and communities across the U.S. who stepped up to extraordinary challenges during WWII. Best Authentic ’40s Period Costume – Dust off your skirt suits and shoulder pads, and slip on those saddle shoes. What would Rosie (or Roger) have worn on a day off? A grand prize Audience Favorite will be chosen from the winners of the contest categories above. At 1:30 pm, Liz Etler will be giving free swing dance lessons. Liz will be teaching the Lindy Hop along with other popular dance moves from the 1940s. Plus, Karen Buchanan will be leading a Home Front history walk at 2 pm from the Craneway Pavilion to the Rosie the Riveter Memorial in the Marina Park and back. Join Kathleen for a short hike and the a chance to learn more about the history of the Home Front.